432 pages | 864 B/W Illus. 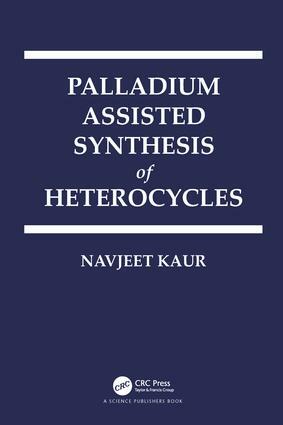 This book is a compilation of the recent applications of palladium catalysts in organic synthesis. The book demonstrates that it is a highly dynamic research field. This methodology has emerged as a powerful tool for the efficient and chemoselective synthesis of heterocyclic molecules. In the past few years, several strategies have been pointed out to pursue more efficient, sustainable, and environment friendly chemical processes. Among those strategies, catalysis and the design of new processes that avoid the use of toxic reagents have been the focus of intense research. Dr. Navjeet Kaur was awarded her Ph.D. in 2014 at Banasthali University. Presently, she is an assistant professor in the Department of Chemistry in the same university. She entered into a specialized research career focused on the synthesis of 1,4-benzodiazepine based heterocyclic compounds (Organic Synthetic and Medicinal Chemistry). With 6 years of teaching experience, she has published 85 scientific research papers and review articles in the field of organic synthesis in reputed national and international journals. She has attended around 30 conferences/workshops/seminars, and has completed a two year Sikh Missionary course from Sikh Missionary College, Ludhiana, Punjab.